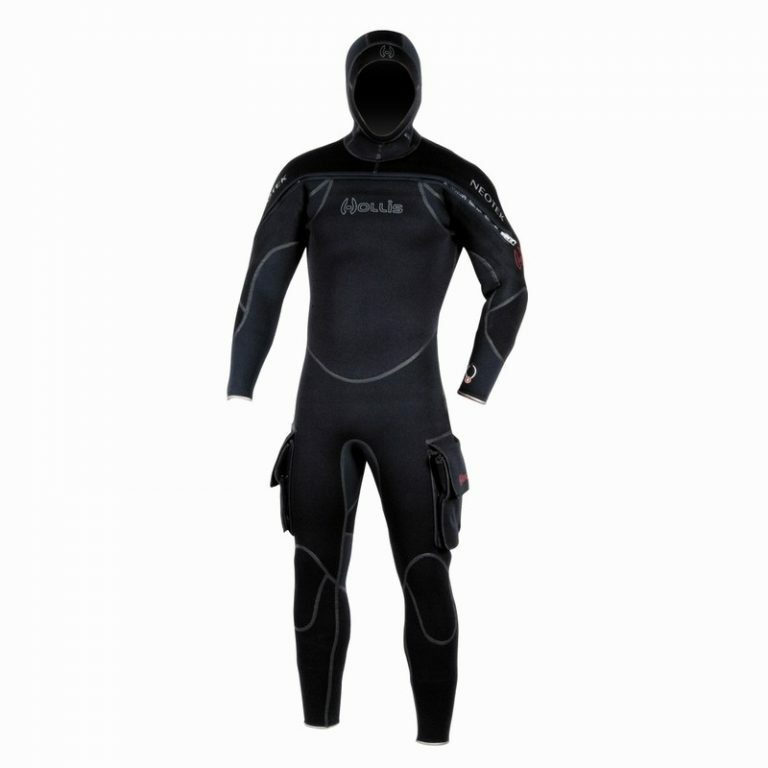 I got the Hollis Neotek 8/7/6 because I had heard great things and winter had started and 40-minute dives were almost unbearable in my (used to be 7mm) open cell wetsuit with well over 200 dives to its name. I am currently diving in 16-degree water without any other layers under my Neotek and after 3 x 40-minute dives am I starting to get cold and mainly in my feet which aren’t even covered by the Neotek. As I frog kick I get the odd Warm flush of water up my back (it’s not pee I swear!) and it is absolutely amazing, There is a thick pad running down the spine of the suit for comfort and on other suits I’ve noticed that’s where I used to get cold first. Not with the Neotek. The “ThermaSkin” inner lining is amazing to get into compared to other suits even when it is wet I don’t get that cold shock getting into it. The pockets are great. They have sewn in D-rings and have enough room to fit a 40-meter wreck reel and DSMB in one pocket. Perfect positioning as well, in sidemount it is easy enough to just reach around your tank and get into the pocket. I once saw someone had cut the pockets off because they didn’t look cool… I completely disagree, this is a very cool looking suit and within a month of diving they had massive regrets. These pockets are EPIC! My only regret is not getting this suit sooner. I’m quite resilient to the cold as it is so I really didn’t know how good everyone had it compared to me in my old suit. I had to add pockets to my BCD and clip things here and there. Now I’m warm, streamline and looking good. Notifications, Special Offers Auckland, Boat, Careers, Cavalli Islands, Dive Gear, Diving, guide, Hen and Chicks, hmnzs, Hollis, Hollis Explorer, neotek, new zealand, NZ, PADI, PADI Advanced, PADI Dive Instructor, Poor Knights, review, Special Offers, Tertiary Course, wetsuit, wreck, Wreck Diving. permalink.